Miami’s Ed Calle has been dazzling audiences with his bountiful musical gifts for about a quarter of a century. From the start, it was obvious that he was a natural player and now, at 39, Calle has been heard on thousands of recordings both as a sideman and a soloist, and his resume includes tour dates with some of the biggest names in the business. Even if Calle’s name is unfamiliar to you, it is guaranteed that you have heard his music. His fiery tenor has graced the work of Gloria Estefan from the earliest days of the Miami Sound Machine, and he’s heard on Grammy-award-winning recordings by Arturo Sandoval, Vicky Carr and pop singer Jon Secada. You have also heard him with Julio Iglesias, Vanessa Williams, Bob James, Frank Sinatra and many others, as well as on television and in motion picture soundtracks. The man is not only gifted, but versatile whether it be rock, jazz or pop. Calle has done it all and done it well. 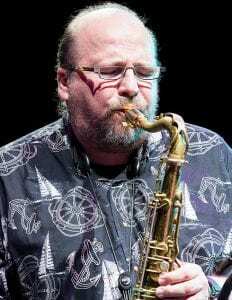 His passion, however, is jazz, an affection he discovered upon hearing a Michael Brecker recording back in his teen years as a student at the University of Miami. Since then he has never looked back. Born in Caracas of Spanish parents, the Latin connection is also a part of his sound, an ingredient that adds just the right touch of spice for his latest solo recording, Sunset Harbor (CCD-4856-2), on the Concord Vista label. The fourth recording under his own name, Calle is proud of the finished product that bears his trademarks of rich melodies and great harmony.